Virgin founder Sir Richard Branson is the face of an integrated campaign to launch the firm's first loyalty rewards app across all its UK businesses. Dubbed Virgin Red, the app is available on Android and iOS devices and is being promoted via outdoor advertising, PR, social and retail activities across all Virgin businesses. Central to the campaign is the V Marks the Spot promotion, a treasure hunt kicking off on 1 July, which sees one million physical and digital gold coins hidden around the UK. 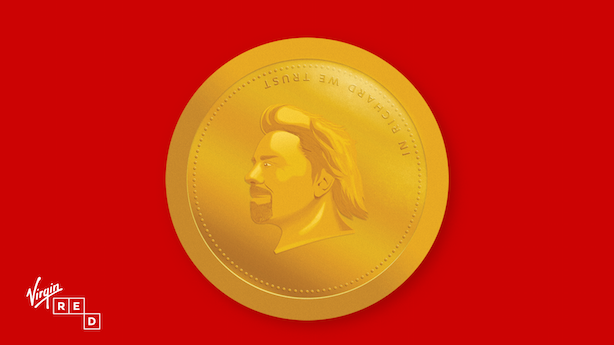 Each coin will have a digital code that unlocks points within the app and nine people will win the chance to fly Upper Class to Sir Richard Branson’s estate on Moskito Island and participate in a real treasure hunt. Virgin worked with numerous agencies to launch the project, which has been in development for two years. Creative agency Mr President was drafted in to shape the Virgin Red brand as well as create the V Marks the Spot campaign. Mobile enterprise tech firm DMI International built the mobile application and Speed Communications is handling PR activity and organising a launch event at Kensington Roof Gardens on 27 June where the first trip to Moskito Island will be won. "The majority of promotion will be carried out in the digital world, through email, Virgin Media and Tevo, but we have hidden coins throughout the country in phone boxes, trains and in stores. The central concept of the campaign is to show customers that they will be rewarded for ‘living a life more Virgin’. This will be done by promoting offers across our business from 20 per cent off Virgin trains to buy-one-get-one-free drinks with our partners such as Cafe Nero," Helen Tupper, marketing director at Virgin Red, told PRWeek. "Sir Richard Branson always wanted us to have a campaign including a real-life treasure hunt with participants digging for prizes in the sand, and he signed off our pitch in 2014. The treasure hunt is open to everyone, but Virgin customers will be verified through the app and will receive extra clues and points, giving them a higher chance of winning," Tupper added. Post-July, the main priority will then shift to integrating Virgin Red into all parts of the company, with customers encouraged to download the app when they purchase Virgin products so that they can receive special offers.